Three runners for the team on Tuesday with Lady Loft, Nanita and Potemkin heading to Sale. Lady Loft is the first to go in race three, the Open Maiden over 1208m where she will be ridden by Brian Higgins and jump from barrier 12 after scratchings. The daughter of Roman Emperor has raced twice this preparation, finishing unplaced last start at Geelong in April. Mike Moroney has changed tactics slightly with Lady Loft. “She went off a bit hard in front last time when another horse came alongside and I’m inclined to let her settle where she is comfortable,” Moroney said. “I’d see her midfield and then see if she runs home. Nanita runs in race six, the 3YO Fillies Handicap over 1208m with Brian Higgins in the saddle and to jump from barrier seven after scratchings. 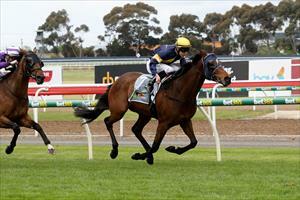 The daughter of Not A Single Doubt won her last start over 1200m at Kilmore on April 26. “It’s a step up in class and it looks handy enough,” Moroney said. “I’m not so sure about her in soft ground but it’s Super VOBIS and worth taking a chance. Potemkin (pictured) is in the last race, the Benchmark 64 Handicap over 1419m with Harry Grace to reduce the weight to 59.5kg and start from barrier four. Potemkin ran well first-up when runner-up at Geelong over 1325m and Moroney said he has improved since. “He looks well placed and the wet track will not worry him,” Moroney said. “It is the last race of the day so it will depend on how the track is playing at that stage of the day.